Scott had a desk that we have been trying to get rid of because it just takes up space in our garage and I've listed it in the paper several times with no luck. I finally got a taker yesterday and I arranged to meet this lady at our house right after work to help her get it loaded. I called Scott and told him I had sold it and that I was meeting this lady. I gave him her name and where she worked in case he came home and I was missing - he would know who to suspect. (you can just never know these days). Anyway .... I also told him that if I did end up missing - to make sure and pick out a flattering picture of me to put on the news and in the papers. I've thought about this before - when people are missing - their family members sometimes post the most random pictures and sometimes they are like six years old. I told Scott if I ended up in People magazine - I at least wanted a decent picture. So then I was trying to think of what picture I would want. There aren't that many flattering ones of me ......so I finally decided on this one. 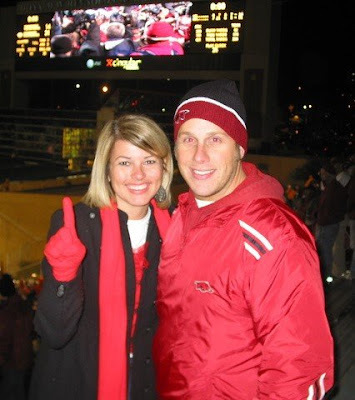 This was right after we beat Tennessee this year on ESPN on a very cold night. It was a happy time and not too bad of a hair day. Ha ha ha! This is the kind of useless stuff I actually spend precious moments of my life thinking about. That is really funny. I am glad the woman didn't get you! That would have been an episode of 48 Hours Mystery on CBS. But would you cry about it like Jen did on BB8? Are you watching this year? I couldn't believe she was seriously crying about the picture of her they chose to put up on the wall. Okay-you are hilarious!!! However, I think you should use the picture of you at the beach with the water splashing up on you! I love that pic. It looks like a model shot! That one may be too far away, though! I was, indeed, in Flippin last week. I have been meaning to email you. In fact, I think the house we stayed at is right by your dad's church. First Baptist Flippin? How many Baptist churches can there be in Flippin?!?! That's so funny! This is a great picture of you. And this is why I love my friend Kelly!!!! You're hilarious! Great photo I must say! I'm just glad to know that other women are as skeptical about people and worry their husbands with it too! Mario is always teasing me about thinking of the most awful things that could happen to me but you just can't be too careful!